Firefly is a western in space, people. In space. Starring the charming Nathan Fillion. 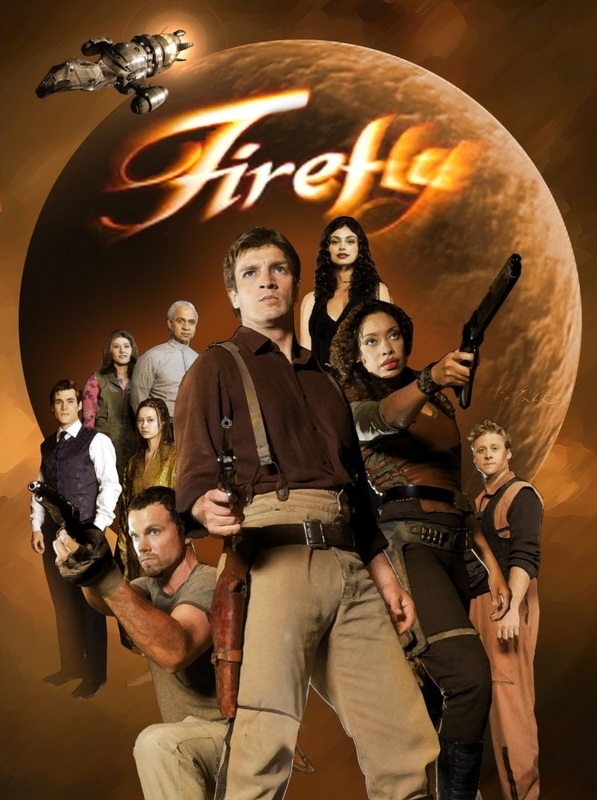 With a director like Joss Whedon, great writing, award winning CG, and a storyline that stands out from the usual TV drama regurgitant, why did it get cancelled after a single season? If it can happen to Joss, it can happen to you. You think you’ve written an amazing book. It’s original, it’s funny, it tugs on the heartstrings, the characters are well rounded, and the reader can identify with their goals and desires. It’s got everything. You start at the top of your agent/publisher list and rapid fire your next bestseller off. What could possibly go wrong? The answer? Any number of things that may have nothing to do with your actual book. When a publisher buys a book, it’s a guessing game. They’re playing the lottery. Yes, they have experience and can make educated guesses about what will sell based on the current market and trends. But remember, publishers are picking up books now that won’t see the shelf for two years (that’s just how the process works). So who’s to say that a book about magical morphing kittens won’t be the next big thing two years from now? So magical morphing kittens are going to be huge (I can’t believe I’m sharing this highly classified info right now). Maybe a publisher picks up your kitten book but someone else beats you to the punch, and suddenly magical morphing kitten books are taking over the shelves just as yours comes out. Now it doesn’t really stand out like it would have. *Shrug* The market is a fickle beast. You love your book. That’s why you wrote it. I guarantee there are other people out there just like you that will love to read it. But maybe your particular subject is very specific, meaning it might only appeal to a very small target audience. Just look at Firefly, for example. What? You mean not everyone is interested in a group of renegade space cowboys living in an American-Chinese culture on the outskirts of society? You’re crazy! Can’t you see a publishing house saying the same thing about a book that they love? While they do what they do because they love books, it’s still a business that needs to make money, and sometimes that means choosing books that can reach a broader audience. Cost verses revenue. Now I’m not going to get into the whole discussion about how Fox contributed to the demise of the Firefly series due to certain decisions about scheduling and promotions. What I will say is that additional effort and focus on promoting the series would have made a huge difference. Think about it. If you publish a novel and no one knows about it, then who’s going to buy it? No one. That’s who. There’s a wide array of options available for writers to promote their work. Sometimes you’re lucky and word of mouth kicks in. Most of the time, you need to get creative in reaching that special little audience that’s interested in your specific topic. But I guarantee you, if you do nothing, your chances of being successful are next to none. If you don’t like marketing, you’re in the wrong business. Traditionally speaking, you can’t get published without a publisher. You can’t get a publisher without an agent. You can’t get an agent without some credibility. How the heck do you get credibility? So you’ve written a great novel? So what? Now get someone to actually read it. A single agent can receive hundreds of query letters a week. A week! And getting through them all is just a small portion of their job. So how can you stand out from the rest of the slush pile? Sometimes a solid resume helps. More evidence that you are the right person to write that novel. Contests, past article publications, affiliation with writing organizations. Prove that you are a professional writer, not just some person who wrote this book you thought up. We all know that traditional publishing isn’t our only option anymore. But even if you self-publish, you still have to get the attention of critics, reviewers, writing magazines and periodicals, organizations where you can speak and promote yourself. The list is endless. You can’t sit back and put your feet up, expecting your book to fly off the shelves. Are you visible on the internet? Can people find your work easily? If people find your novel online to buy, do they really know what they’re getting? Are you promoting yourself effectively? And finally, sometimes the stars simply don’t align. Through a seemingly random sequence of unfortunate events, it’s as though the universe is conspiring against you. The stars are laughing at you. A good writer would laugh back. Sometimes no matter how great our novel is, it just doesn’t hit the big time or get the attention it should when it might have under other circumstances. But as writers, we write what we love, what moves us, what speaks to us. If we start writing for the market, with specific audiences in mind, because publisher A told us space monkeys are going to be huge, or agent B said they want more of vampire fairy werewolves, writing becomes work. You’ll start to play the game. Don’t lose sight of why you really started to write in the first place. If at first you don’t succeed, try try again. Eventually your time will come, and it will feel much more rewarding because you did it for the love, not the money. William Golding’s Lord Of The Flies was rejected by 20 publishers. John Grisham’s novel A Time To Kill went through 16 agents and a dozen publishers. Frank Herbert’s Dune was rejected 20 times before being published. Meg Cabot’s The Princess Diaries was rejected by 17 publishers. It just goes to show you that sometimes good writing doesn’t always mean instant success.